You can check your refund status using our refund status application or by calling our automated refund line at 803-898-5300. Both options are available 24/7, and provide the same information as our customer service representatives. If you filed electronically and received a confirmation from your tax preparation software, we have received your return. You can expect your refund to move through our review process within 6-8 weeks from the date you filed. Status changes are posted nightly. 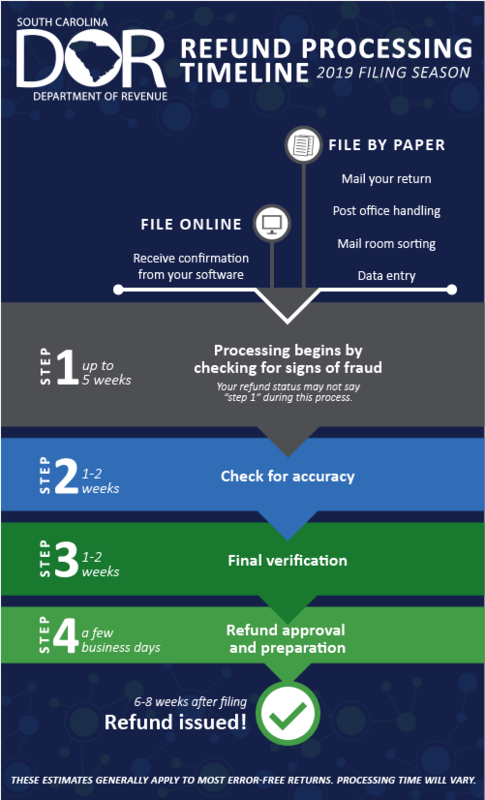 Find out how long you can expect to be in each step of processing in the Refund Processing Timeline. If you filed by paper, it may take more time for your refund status to update. What could slow down your refund? We will contact you by mail if we need more information to process your return. When we process your return, we have to make sure we are collecting the right amount of tax and issuing the correct refund (if a refund is due). We make sure your return is complete, accurate, and that it's coming from you – and not someone pretending to be you. That means looking for the little things – like ensuring your return is signed and filled out; verifying the big things – like your calculations; and checking for red flags – using manual checks and analytics tools to find signs of fraud. Our enhanced fraud measures may mean that some returns take a little longer to process, but we want your refund to end up in your pocket, and not in the hands of a criminal. How is the SCDOR protecting taxpayers? Tax refund fraud costs the US billions of dollars every year, so our anti-fraud measures remain aggressive this tax season. We review returns and verify data to ensure that criminals aren't trying to file a fake return and steal your refund. Our systematic processes help us identify, isolate, and stop potentially fraudulent returns. Some taxpayers may receive a letter from the SCDOR directing them to visit MyDORWAY to complete an Identity Verification Quiz or Individual Code Verification after filing their return. This is just another step we are taking to keep your information private. Learn more about our commitment to fighting fraud on our Security Center. How quickly will you get your refund? Refund processing is expected to take 6-8 weeks from February 4 or the date you filed, whichever is later, so please use that timeframe to set your expectations. Every return is processed independently, so it is normal for processing time to vary even if two returns are similar. Take into consideration the time it takes for your bank to post your direct deposit to your account or for mail delivery if you requested a check. See "What could slow down your refund?" above for more information. Will calling the SCDOR help you get your refund faster? Will the refund status application tell you when you will receive your refund? Yes. 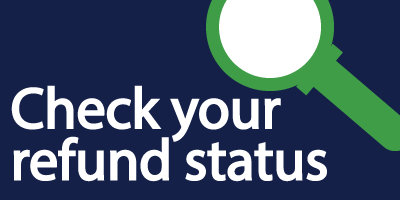 When your refund is approved, your status will update with an issued date letting you know your refund is on the way. See the Refund Processing Timeline for more information about how long to expect to be in each stage of processing. Why am I being asked to verify my withholding? Because you are not required to attach copies of W2s or 1099s to your return when you file electronically, we may contact you so that we can verify the amounts on your return. Your employer/payer may not have submitted W2s or 1099s to the SCDOR, or the information they submitted may not match what you entered on your return. If you receive a letter asking to verify your withholding, you need to provide the requested documents so we can continue processing your return. For fastest processing, use the email address or fax number provided in the letter. If you email your documents, we will send you a response letting you know we received them. Check your email and allow 1-2 business days for processing. If you fax your documents, please allow 1-2 business days for processing. Why is my refund different than the amount on the tax return I filed? Your refund amount may be different if we had to make changes to your tax return. We will send you a letter detailing those changes if that is the case. Your refund amount may also change if you have a debt due to government agencies or public or private institutions of higher learning. We are authorized to reduce your refund to pay the debt. If all or part of your refund is seized, you will receive a letter with more information including who to contact if you have questions. Any refund remaining after the debts are paid will be sent to you. If you think you have an outstanding debt with a state agency or public or private institution of higher learning, contact the agency directly. If any of your refund is used to pay an outstanding debt and you have questions, directly contact the agency you owe.